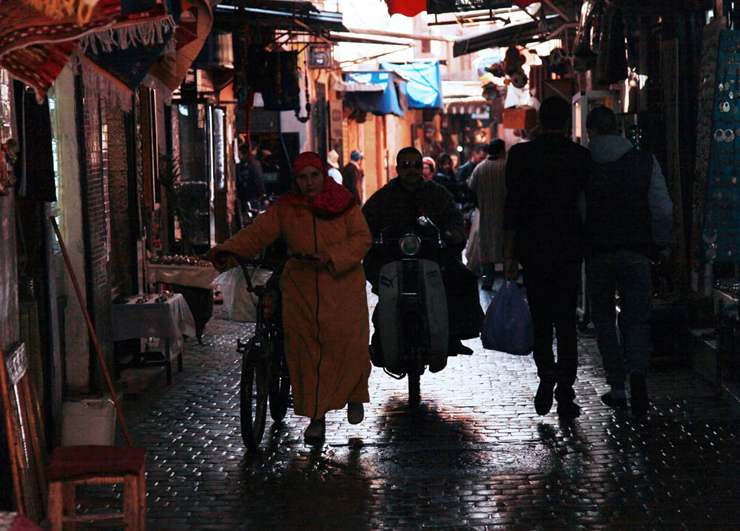 Marrakech's old city greets you with winding narrow streets, speeding Vespas and razor thin margins for passing. 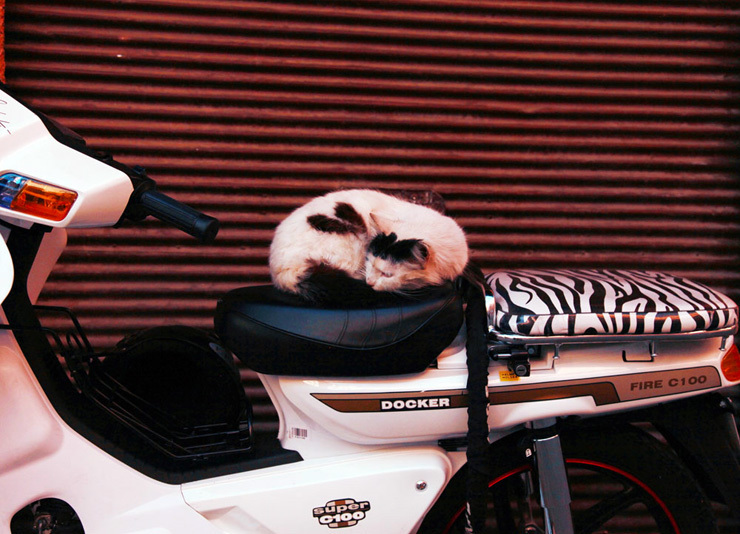 There are insistent vendors, pointed mountains of spices, piles of oranges, the fragrance of roses and argan oil, hammam massage offers, un-metered taxis, slowly clopping horse-drawn carriages and plenty of scruffy cats sitting in doorways and lying in patches of sun. 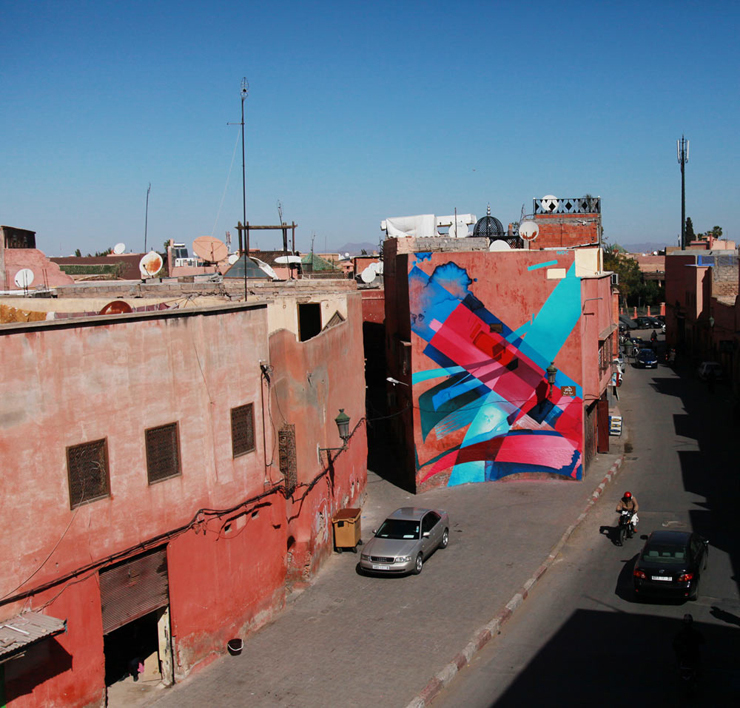 This year the Medina also includes street art -- or at least murals by graffiti and street artists. As a parallel project to the 6th Marrakech Biennale, an 11-artist program called MB6 Street Art is bringing a series of murals scattered through the fortified 954-year old city upon second floor rooftops, larger multi-story walls abutting busy parking lots, and a couple of elongated one story pieces in the narrow souk alleys that make this city magic and easy to get lost in. 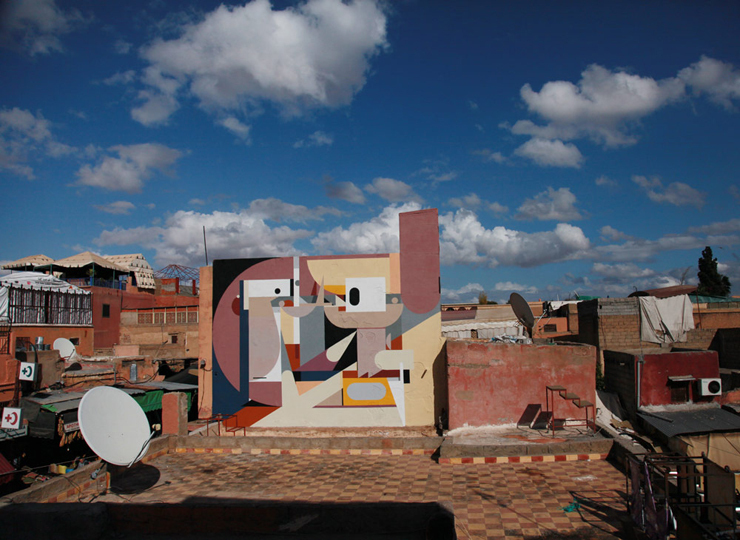 The primarily European roster of street artists may deviate somewhat from the decolonizing goals of Biennale curator Reem Fadda, who says that she selected her nearly 50 artists primarily from Africa, Asia and the Diaspora, to "give what is regarded as the Global South a voice of its own, and in many ways, to own that voice." The Associate Curator of Middle Eastern Art for the Abu Dhabi Project of the Solomon R. Guggenheim, who is currently based at the Guggenheim in New York, Ms. Fadda presented the scope of this years program alongside Executive President Mohamed Amine Kabbaj during the opening press conference at the lushly appointed Hotel Mamounia, which was translated live for visitors through interpreters in French and English. 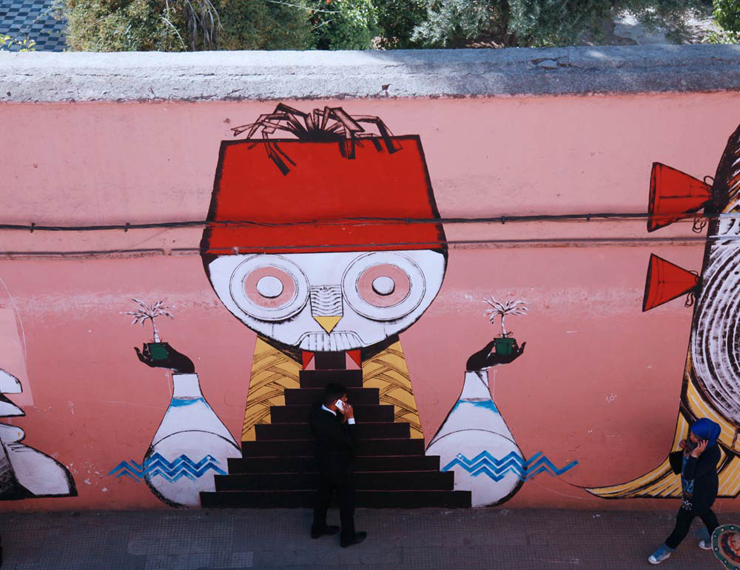 Unlike most of the Biennale pieces, which necessarily are displayed indoors under watchful eyes, all the new murals in this first-ever street art contingent are free to see and open to all members of the public on the street day and night. 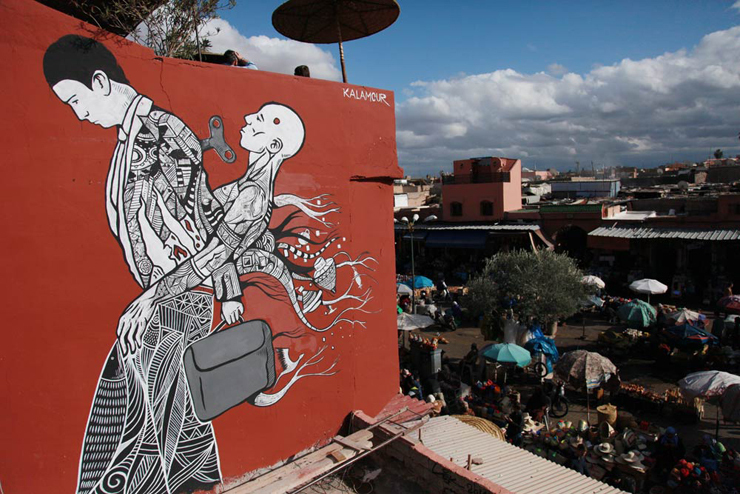 While this is typical for street art followers it is also in alignment with the root of Fadda's concept of a "Living City" and "that which has an active sense of participation, where art is socially and politically engaged, allowing for that dialogue with the place and with people and society." All during the initial week of the 11-week program we witnessed a level of engagement from passersby that rivaled the works in the grand historic sites mapped out by the Biennale, perhaps because the artists were alive and creating new works before your eyes in many cases. Many artists here have backgrounds in illegal graffiti and street art, at least when they were younger, and have adopted a hidden persona or nom de plume traditionally, one that prefers to go unnoticed. Here in Marrakech these artists found an inquisitive and appreciative audience, altering their experience a great deal, if not entirely. "Obviously there are thousands of people marching past you and speeding by on motorbikes -- but it is nice," says London's Remi Rough, whose origins are in graffiti and style-writing but in recent years has become known more as a "graffuturist" who blends abstraction and clean geometry on city walls. 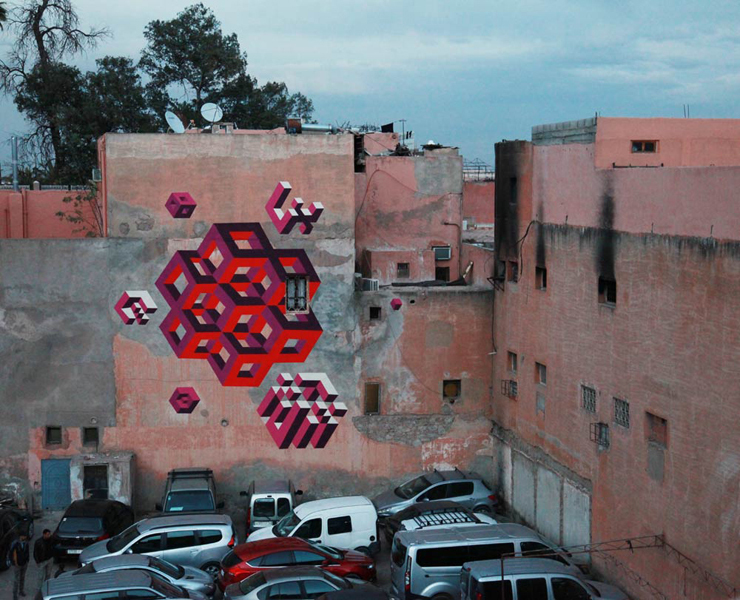 The large-scale piece he did on a scissor lift in Marrakech plays alongside an equally grand geometrically inspired piece by a frequent collaborator, the Strasbourg-born LX One. Describing the street scene, Rough echoes the sentiment of many visiting artists. "It's kind of 'organized chaotic' here." Because of the cultural considerations regarding content here -- namely a sensitivity to bodies and politics -- many of these artists found themselves concerning their choices of style and topic with greater care than usual. But taking into consideration the guidelines of his hosts doesn't rankle Rough, not least because his geometric forms won't easily run afoul of these suggestions. Nonetheless, "I always do a bit of research on the place, on the people. I don't want to be the artist who just turns up and goes, 'Yeah I'm going to paint this wall' and who doesn't ask about who owns it, who lives there, what the area is like, what's happening. I think as artists it's our responsibility to ask those questions and I don't think enough do." 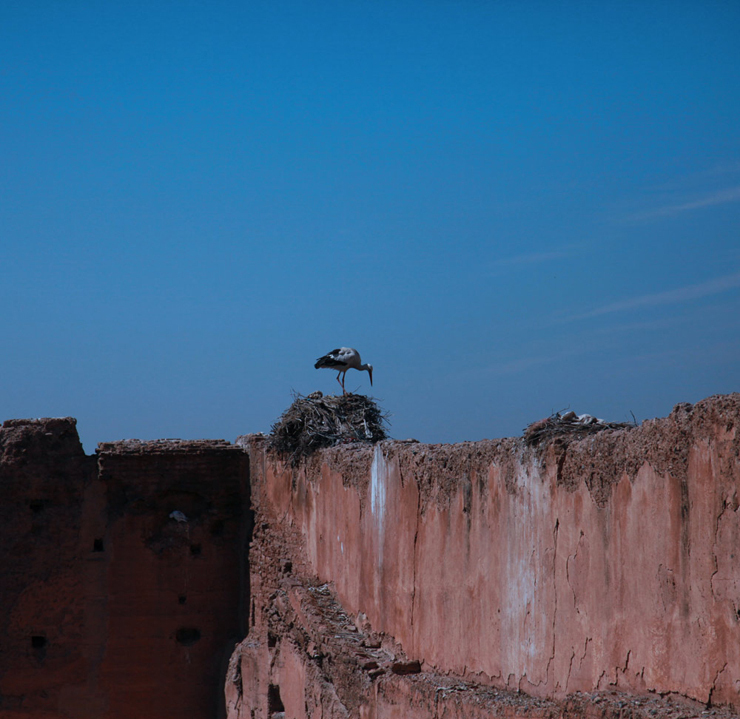 A sage and stately Moroccan stork sitting in her nest atop the perforated wall of Palais El Badii has an inside/outside vantage point of this Biennale. She looks at El Anatsui's enormous new Kindred Viewpoints, a sculptural fabric of aluminum bottle caps and copper wire draped across a scaffolding among the sunken gardens of the ruins and at the end of 90 meter long pool. Turning her long bill to look outside the fortified walls she can gaze upon a newly aerosoled rose motif carefully spaced across a red street wall by the London based Dotmasters, "I have had to find something non figurative to fit with the local culture," says Dotmasters on his personal blog for his fans to see into his process, perhaps preparing for derisive remarks about his decorative design. Known more for stenciled irony and a wizened street sarcasm back home, the mid-career formally trained painter departs to the organic forms and hand-on-can approach here. "This to-date is my fourth free-hand mural in my life," he says from atop a scaffolding of his choice of roses. "Marrakech is the rose city and the Moroccan rose has the height among rose oil in the world because it's a desert rose and it grows really slowly, so it really packs a punch in the fragrance quotient. 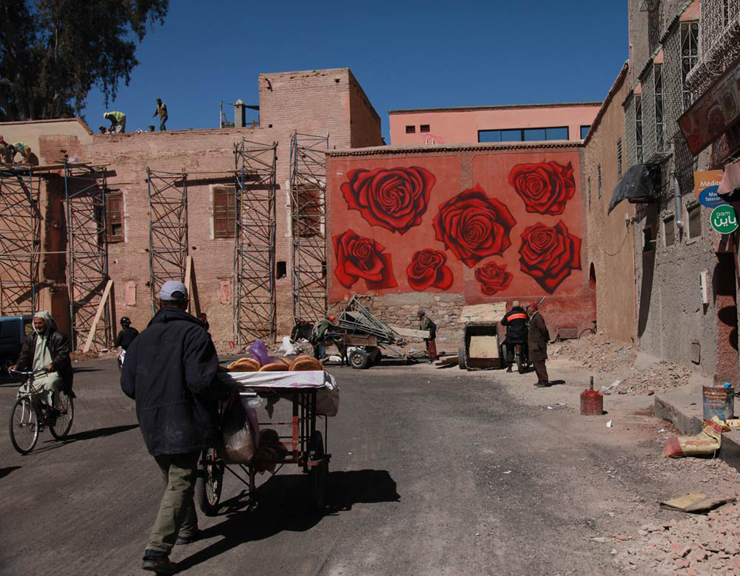 Morocco is quite famed for their roses just for the perfume and oil industry." Without painting the situation with too broad a brush, one may be perplexed about the dichotomy of graffiti-spraying vandals having some appreciation for the norms of a host society while cherishing the practice of violating them where they grew up. Perhaps it is simply a matter of international diplomacy by a visitor, but still sort of a curious point that some may ponder. This crossroads is not only North meeting South it is also illegal graffiti writers and street artists grappling with the growing popularity of legal murals at commercial, institutional, and community art festivals around the world. We continue to observe rebels being perfect schoolboys/girls in their host town and we wonder about the construction of persona, practice, and environment. Sickboy sat down to talk about his wall and said he had been avoiding some of his typical symbols like caskets and marijuana joints -- and he revealed that he actually altered his painting because he was responding to the community. Someone had crossed out the abbreviation letters of his crew back home "KKS" (Kold Krush Sisters). Not knowing French or Arabic, he tells us that he couldn't figure out what the problem was, so he just painted a motif over it himself rather than risk offending further. A local elder with a gray beard asked us one day to explain a series of symbols on Sickboy's mural -- pointing to an eye and a heart which were meant to say something like "I love peace lovers". He wanted to be assured that it was not about things about mysticism or of a sexual nature. We asked Sickboy if he ever feels like this or other mural projects present a conflict for the original attitude of rebelliousness that he began with in the graffiti scene? To us it seemed an irony that he was talking about working with the shop owners nearby, including commissioning a pair of custom shoes from the cobbler and creating a new business sign for him. The anarchy-loving Sickboy also re-painted the tiny store of the tobacco seller whose cart was attached to the wall the artist was painting. "I painted all the details, I painted the star of Morocco on it. I didn't do any symbols that he didn't like," he explains. And then to our question he responds, "Yeah I think I'm one of the few artists here who has done more painting of the illegal side - the shutters, the fast letters - and I still use that as something of an extracurricular side of my studio practice - to be gangster but because it feels very free. But I think that as you get older your reasons for doing things changes. I like it because I feel dynamic when I do illegal graffiti and I feel like I'm getting one over - not Ninja, but I'm being super stealth. I think when you do this kind of project it just morphs slightly." "I feel like this is in between what you do in the graffiti scene (and the reasons you do it) -- and the art studio practice. There are different levels of compromise. Here you are just trying to respect the heritage of the building, the area, the people, the symbols." Italy's Giacomo Bufarini, or RUN, began as an illegal graffiti writer back home in Ancona running with crews in the mid-1990s long before he transitioned to a more character-based folk symbolism that has taken him to cities and festivals around the world as a brush and roller painter. 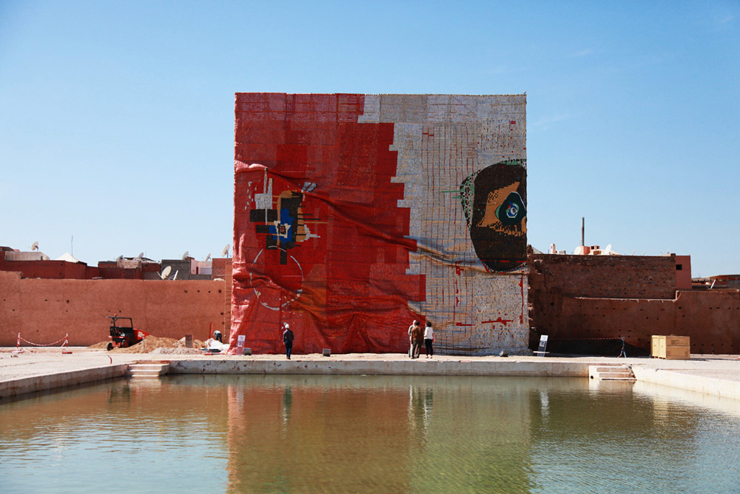 After completing a massive 6,400 square meter mural in a public square during the previous week at seaside Essaouira that addresses the immigration/migration crises currently engulfing the Global North and South RUN created a series of seven flat fantastic characters and symbols on a long one-story wall outside of Palais Bahia, another location for the main biennale. He shows us his original hand sketches in his book that sits among the ladders and bucket paints, and tells us that he was very inspired by characters in the animated film "Kirikou" for these abstracted figures. Further up the block there is a small craft art store that sells handmade lamps made from sardine cans by the shop owner, who introduces himself as Ahmed. 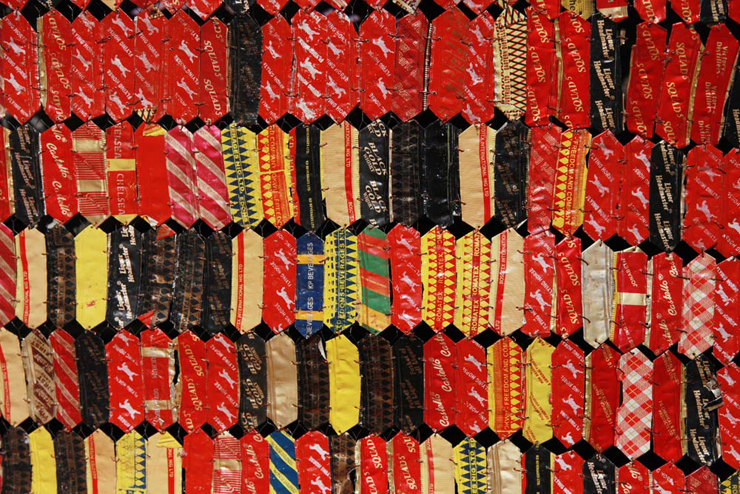 We speak with him about the recycling work of El Anatsui and many African artists from a traditional perspective. We also ask him about the new paintings that RUN has just created while standing atop Ahmed's roof across from a multi-domed Hamman; the images of a man sitting upon a camel and a depiction of the iconic storks from the region. "What he did was beautiful -- the symbol of the storks. 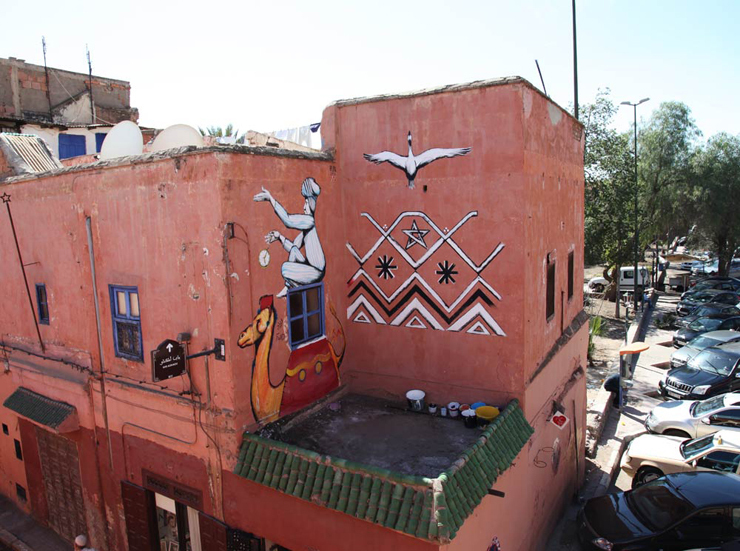 This kind of stork is a symbol of the Medina, here on the wall, near the palace, a symbol of Marrakech. It is nice, and also the camel - it refers to our history," say Ahmed. 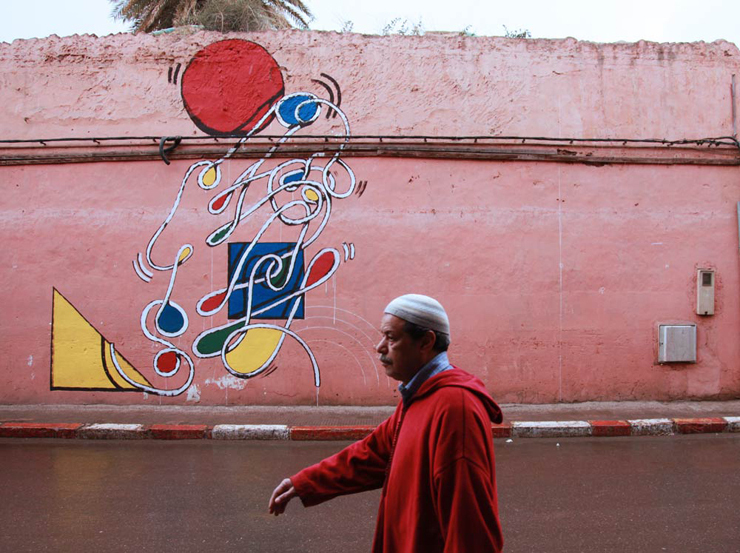 Talk turns to his view of an immediate needs for arts and education here in Marrakech, and Ahmed says he is cheered to see many come for the Biennale and hopes the focus on fine art translates into art programs for the kids and teenagers who live in the neighborhood. "They don't make art schools here. Also we don't have any galleries to go to to learn about art, music, or crafts," he says. "There is nothing here. We have a lot of people who love art, who have a hobby of making art, but they are lost. With art, everyone has it in the blood -- it has no nationality, no borders." 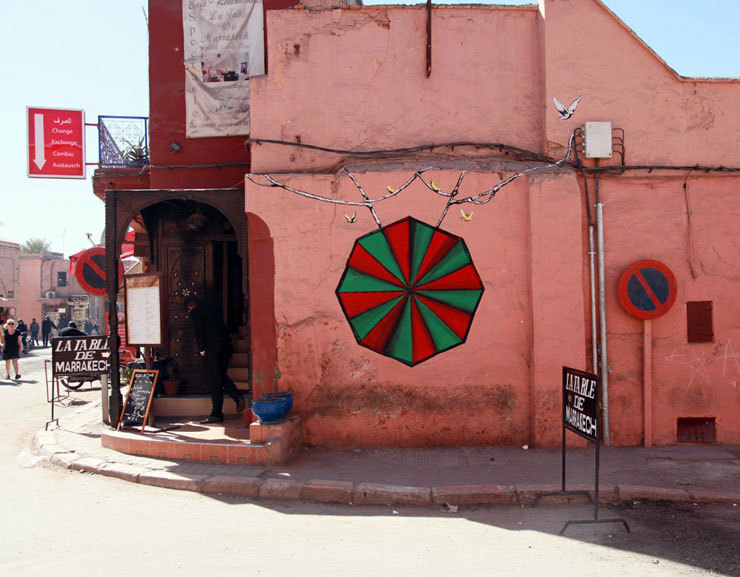 In truth, Marrakech is reported to have twenty five or more galleries and in recent years there has been some development of arts programs for youth but obviously the perception in this part of the old city indicates a desire for more. 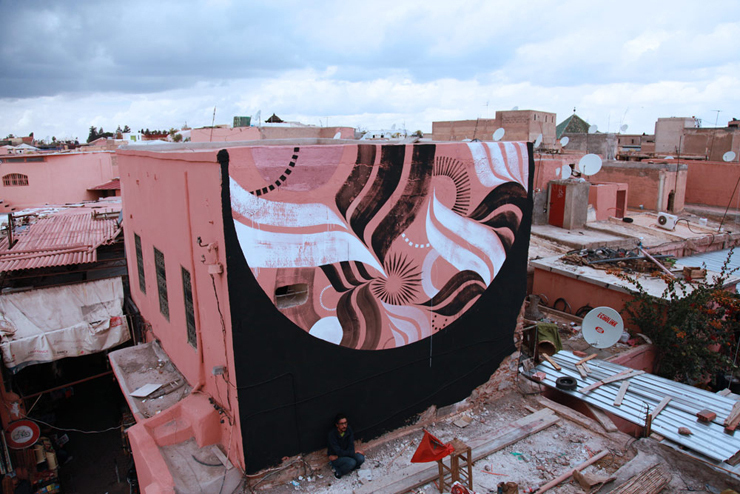 A ten minute walk north of Djemaa El-Fna and above an open air souk clearing are four new murals by MB6 artists; Birmingham UK's Lucy McLauchlan, local Moroccan artist Kalamour, Moscow's Alexey Lucas, and France's Yesbeee. 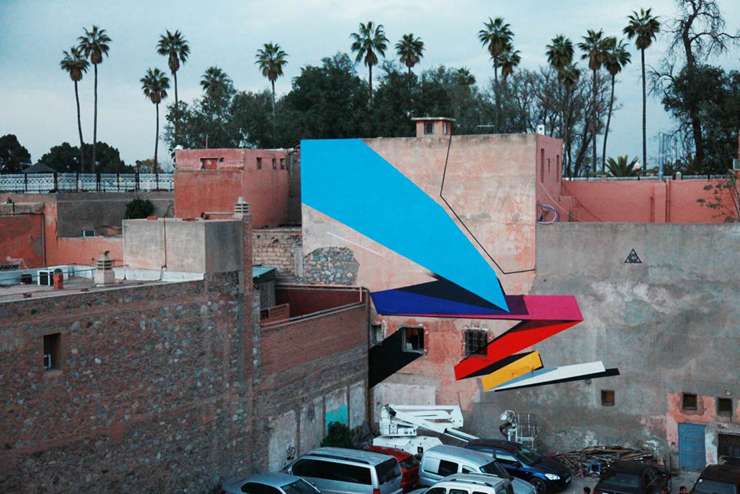 All four murals are visible from the market below and three of the artists work in the realms of abstract. Ironically it was the local artist named Kalamour who had some negative feedback from a local man who was watching the progression of the piece and who interpreted the two surrealistic male figures as being intertwined intimately. Fortunately the artist was on hand to explain to the neighbor that the metaphorical figures were actually more likely the same man split into two, showing a progression of time. McLauchlan's piece is directly across a roof from Kalamour's and she said their primary adjustment regarding surroundings was not the cacophony of commerce in the market below but was more related to the witch doctor who lived directly underfoot and who stored the remains of an eagle on the roof as preparation for using the animals' body parts in his practice. We ask her if dead eagles are typically at the foot of her ladder when she is painting. "I'd have to say that this is a first," says the artist, who has done plenty of painting in sketchy parts of town in the UK and elsewhere. "Excrement, the stench of urine, used needles and condoms, dead rats ... that's what I normally expect to contend with," she laughs. 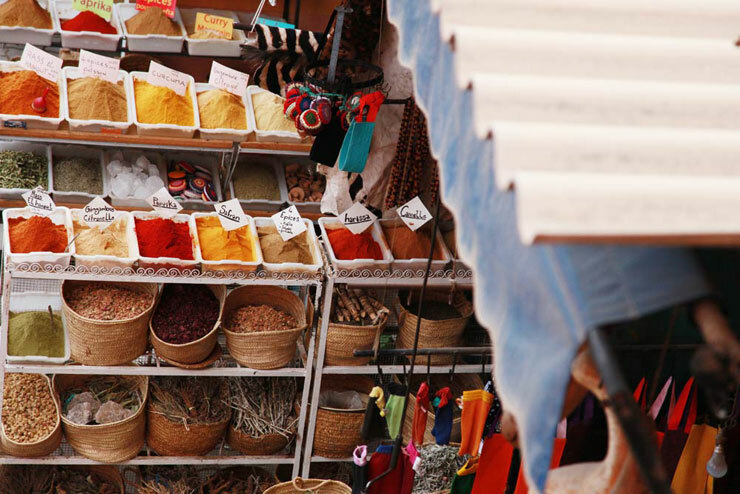 "But a witch doctor's store cupboard; owls, chameleons, the eagle, potion bottles filled with all sorts of things strewn around, no - that wasn't what I was expecting from the rooftops of Marrakech. Then again, I doubt the witch doctor was ever expecting me to turn up and clamber all over his rooftop." Vestalia Chilton, curator of the MB6 Street Art project, and director Terence Rodrigues clearly made history with this inaugural program thanks to their combined knowledge of art dealing and the current urban art scene. Rodrigues has been a dealer, lecturer, and Christie's auctioneer and has been involved with the Biennale since it was first founded by Vanessa Branson in the mid 2000s and was named Arts in Marrakech (AiM). Chilton tells us that she selected the artists partly from her experience with graffiti and street culture as owner of Attollo gallery in London, where she also curates the Croydon Mural Project and does a variety of art consulting activities. Formerly at Sotheby's as an assistant she tells us that she appreciates the public nature of street art which allows for a dialogue with audiences of all backgrounds. She says that the MB6 project has been a great opportunity for her to work with the local population as well as this international collection of artists to create work that she hopes is rewarding for both. Biennale Executive President Mr. Kabbaj also somberly noted during a public talk that this years' biennale is dedicated to the 33-year-old French-Moroccan artist and documentary photographer Leila Alaoui, who died in a terror attack on a restaurant this January 18 in Burkina Faso. 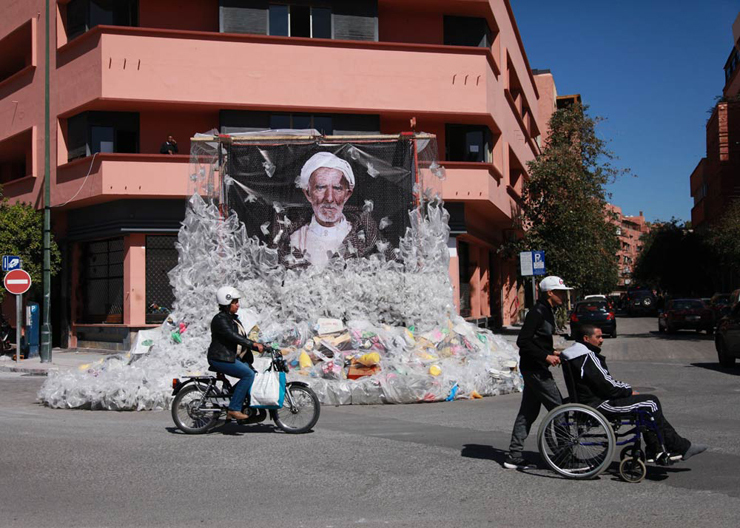 A participant of the 2012 and 2014 Biennales, a full tribute displaying Alaoui's large format photography is exhibited on the street in the Gueliz, or new city. 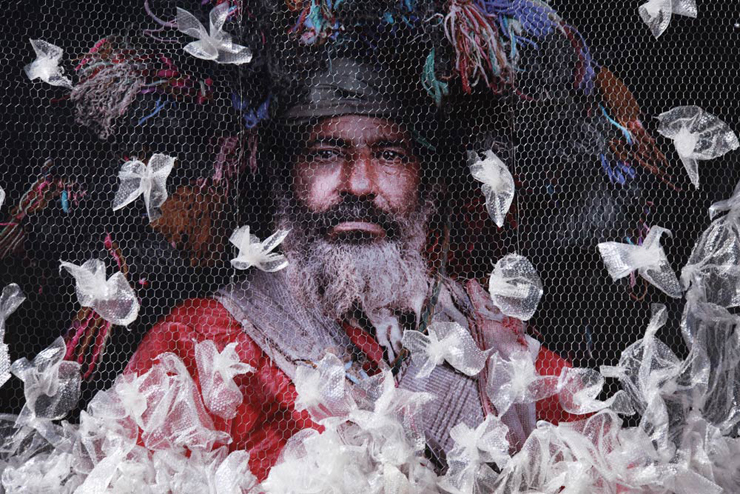 By honoring Alaoui´s passing, the chosen out door sculptural installation feels alive and part of the streets because the photographs of her subjects are displayed in large format on a cube. Uprooted workers from an industrial car production center on Seguin Island on the outskirts of Paris, "I ile au Diable" puts these workers on another island here in a busy pedestrian and vehicular intersection where people are continually passing it. Touching on the themes of migration, dislocation and identify, the subjects again are in perhaps an unfamiliar street scene. "Not New Now" is the theme that the Palestinian-born Ms. Fadda has chosen to represent the curatorial vision and expressions by the artists this year. Analyzing and appreciating the similarities of works inside and outside in this historic city you may interpret the theme as a recognition that humans and our needs for artistic expression have always mined the same desires, regardless of the shiny trappings of the modern age, various cultural hegemonies and our current rather triumphalist technological and commercial wave that seems poised to take over every aspect of life. The Millennial generations' romance with the D.I.Y. (Do It Yourself) approach to art making was simply called "having a craft" for most of history. The recycling of found materials is as old as civilization, and even a resistance to rigid formalism in collaged works of discarded wood by Alexey Lucas in the MB6 gallery show also has certain parallels with artists of the Biennale like the American Al Loving - whose hundreds of pieces of torn fabric are reformed and overlapped, some extending to the floor in his own room at the Palais Bahia. 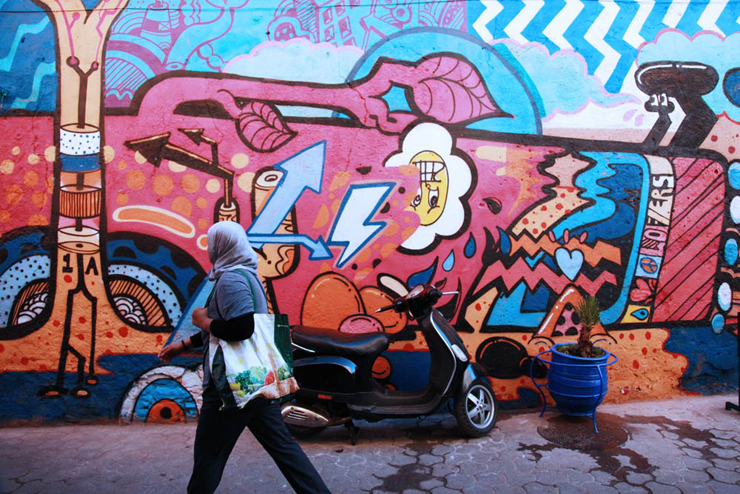 It is unclear how deliberate the coinciding results of the Biennale themes and the public mural practice of MB6 Street Art are but they are undeniable. It may have been more coincidence than plan as Ms. Fadda told us that the acceptance of the mural arts project as a parallel one was as a result of an "open call" rather than an intentionally calculated program of inclusion. Regardless this is not the first overlapping we have witnessed of the formal intentions of institutions and the expressions of so-called Urban Art. 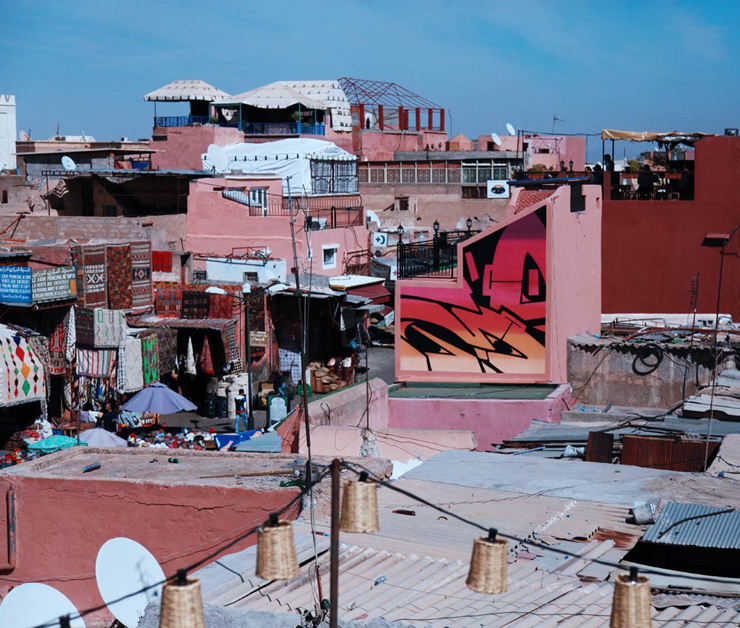 As the established art world continues to assess the meaning and merit of art-in-the-streets as part of a contemporary art conversation, we see intellectual rigor on both sides of the wall and this year in Marrakech, many things are running parallel. 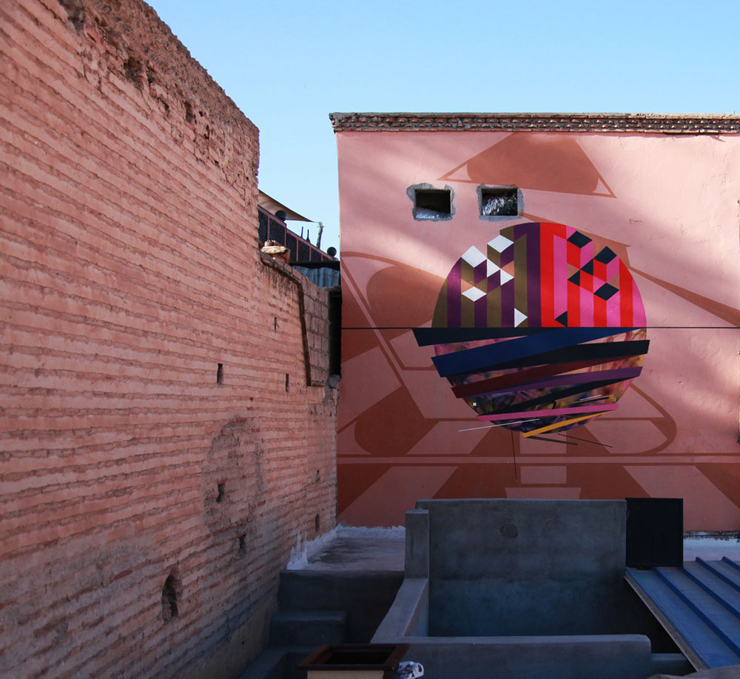 This visit to the Marrakech Biennale 6, which runs through May 8, is a partnership project between Brooklyn Street Art (BSA) and Urban Nation (UN) and it was published first on the Urban Nation Blog. Click HERE to visit Urban Nation Museum For Urban Contemporary Art.